Do I need a Smartphone to fly a drone? Do I need to be in range of WiFi? Do I need active cell phone service to fly? When we first started studying up on drones, these were the questions we had. We were confused about what devices and services were needed to fly a hobby drone. If you are at that stage, then this page is for you. 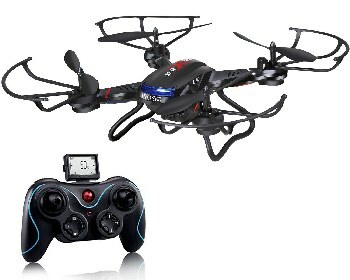 Every UAV (Unmanned Aerial Vehicle, or drone) system has a drone and a controller. What really makes them different is how the flight is piloted or controlled. The Controller: Typically a handheld device with buttons and/or joysticks; kind of like an Xbox or PlayStation controller. The Monitoring Device: This is where the confusion comes in: the monitoring device. How do you see where the drone is going, and how do you control it's flight by that viewpoint? This is called FPV (First Person View, or Video Piloting). In all FPV systems, the drone carries a miniature camera which transmits a real-time image captured up in the air, to the pilot on the ground. FPV goggles; the Smartphone is inserted into the headset/goggles for close-up viewing. 1. LED: Many of the low-end drones (under $200**) provide a small built-in LED screen in the hand controller. This is where you get visual feedback from the drone so you can pilot it. Here is one example. 2. Smartphone: When you reach about the $130 price-point, most drones start requiring a smartphone in order to use FPV (video-assisted piloting). You will need a later-model iPhone or Android with a specific app downloaded to provide the link between the drone camera and the hand controller. 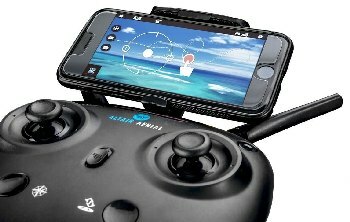 Your Smartphone is temporarily mounted on the controller *** and it displays visuals directly from the drone camera. Photo to left is what a smartphone/controller combo looks like. 3. Goggles: Some of the higher-end drone systems use the phone-mounted controller system but also offer headsets/goggles separately (and usually for much more money). Your smartphone still provides the brains, but is mounted inside the headset for viewing. This creates a much more immersive virtual reality type of experience. 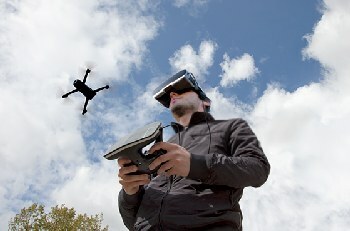 The problem is that most of the optional FPV headsets are very expensive; sometimes almost as much as the drone itself. We found one complete drone package that includes FPV Goggles at a reasonable price and which carries good reviews, the Bebop2 FPV. When a drone requires a smartphone in order to utilize FPV (transmit an image from the drone camera to the pilot), there has to be some way for them to communicate. The drone has it's own built-in Wi-Fi radio, which creates the Wi-Fi (or bluetooth) signal between the drone camera and the smartphone. You don't need a public Wi-Fi hotspot or phone service to make this happen. In other words, you can fly a "smartphone drone" with FPV without any difficulty in a remote area; where there is no public Wi-Fi or cell phone service. But you do need a late-model Smartphone (with app downloaded), in order to make this happen. 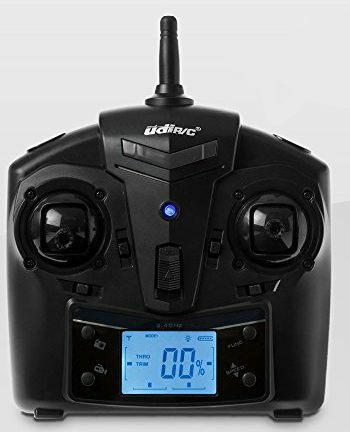 GPS only enters the picture on high-end drones which offer "GPS Features". Typically the drone unit itself is equipped with it's own GPS, and only rarely uses the GPS in the Smartphone. GPS is not needed to fly most hobby drones. More about GPS and drones here. * Some of the low-end toy drones do not have a camera, and so there is no monitoring device. The pilot watches the drone and directs it using the hand controller, based on what he sees from the ground. He gets no transmitted visual feedback from the drone. The drone does not transmit an image, and this is not FPV. 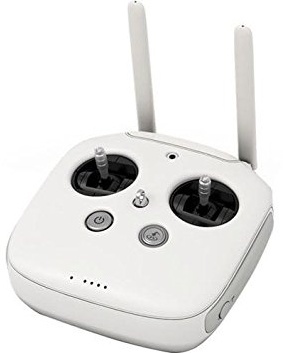 Some of the middle-price-range drones do utilize FPV, but also allow you to pilot the drone at times without using the camera/FPV. Not sure why you would want to do that, but an example of this type of drone is: the Altair #AA108 Camera Drone. 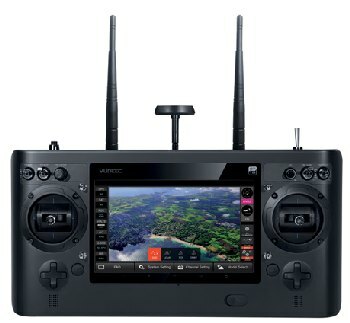 ** There is one series of advanced (read: expensive) drones which also includes it's own display screen with no smartphone involved, and that is Yuneec. This is more convenient than mounting and removing your Smartphone from a controller for each fly. Back to the Drone Buying Guide. Learn how to pilot a Drone the right way; with our Drone Flying Guide. Did you miss Drones 101?